The film begins with a quotation from Edward Gibbon’s Decline and Fall of the Roman Empire. Gibbon’s idea of a long Roman decline brought on by many factors influenced the movie considerably, though the plot is only loosely based on the real historical events of the later second century. The first half of the movie takes place on the German frontier of the Roman Empire, centered on the Emperor Marcus Aurelius. The film portrays Aurelius as a peace-loving cosmopolitan, who dreams of a “New Rome” founded on higher ideals. After receiving all provincial leaders and client kings at his camp, Aurelius gives a speech emphasizing expanding Roman identity and citizenship to all in the empire. The main character, a fictional general by the name of Livius, is told by the emperor that he is his intended heir rather than Aurelius’ son Commodus. Lucilla, the emperor’s daughter, has a relationship with Livius but plans to marry the King of Armenia for political reasons. Aurelius is assassinated by some of Commodus’ lackeys who fear a loss of potential advancement. With a lack of evidence for Aurelius’ wishes, Commodus succeeds him as emperor. The second half of the movie shows Commodus’ descent into ever increasing megalomania, with Livius helping him put down a rebellion and defeat invaders. Finally, Livius has had enough and rebels against Commodus himself. He kills Commodus in a gladiatorial fight and saves Lucilla from being burned alive. However, the empire is not saved. It is being auctioned off to whoever can pay the biggest bribe to the army, and barbarians are burned at the stake as they call upon their war god Wotan to avenge them. 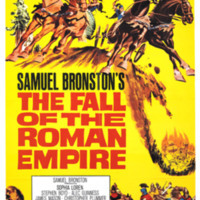 The end of the film foreshadows the “fall” of the Roman Empire to corruption, and invasion by Germanic tribes. This film was an utter disaster at the box office. It cost an estimated $19,000,000 but only grossed $4,750,000, according to the IMDb. The producer was bankrupted, and some have blamed the movie for the death of the Swords-and-Sandals epic, which had been a cornerstone of blockbuster Hollywood filmmaking up until that point. The movie’s portrayal of Marcus Aurelius emphasized his contributions as a stoic philosopher, but was not accurate to his real policies. After his many years of fighting wars on the northern frontier, Aurelius was willing to go to great extremes to deal with the problem permanently. Rather than seeking peace, he was engaged in the systematic extermination of the Quadi at the time of his death and evidence suggests he was planning on making a new province of Germania. His long and grim campaigns bore fruit, and during the reign of his son Commodus Rome did not face invasion from either the Parthians or Germanic tribes. The portrayal of Commodus in the film was likely accurate in portraying his megalomania. Commodus did historically rename the city of Rome after himself and renamed all the army units to Commodiana. However, his reign was far more peaceful on the borders and had far more political violence in Rome than this film suggested. Commodus also did not die in a gladiatorial fight, but rather was strangled in a bathtub and succeeded by a general from Roman Britain called Pertinax. Pertinax was promptly assassinated for attempting to reimpose military discipline standards, beginning the Year of the Five Emperors. The historical Lucilla originally married Lucius Verus (who was co-emperor with Marcus Aurelius for the first part of Aurelius’ reign) and was then made to marry a Syrian Roman politician of a lower social class than her (likely to prevent any threats to Commodus’ succession). She was executed by her brother Commodus after her involvement in a plot to kill him. The film portrayed Germanic barbarians as stone age Neanderthals wielding giant crude clubs. In reality, their society was far more sophisticated, and they fought primarily by charging on foot in a wedge, wielding long spears. The Roman Senate was accurately portrayed in the movie as still possessing a significant measure of power and influence at the time of Aurelius’ death. The film showed the senators as corrupt and toadying up to Commodus, but historically they were violently purged and replaced by Commodus’ lackeys. 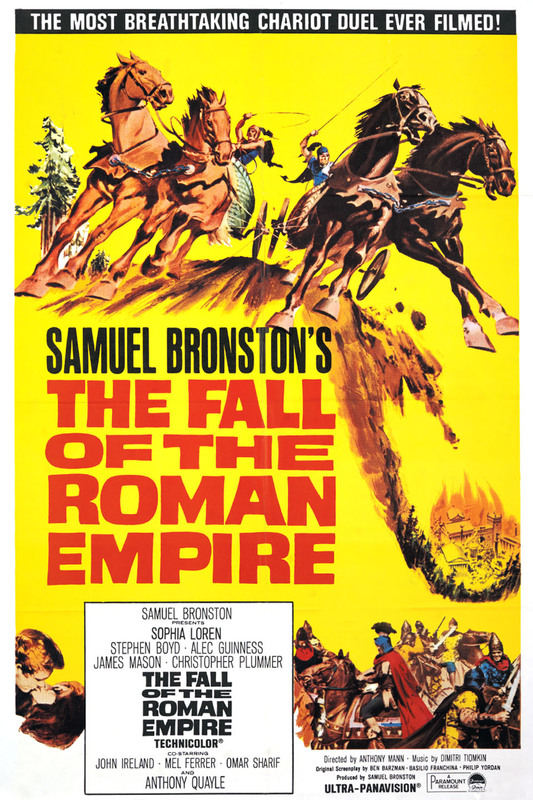 Grant Ellis, “The Fall of the Roman Empire (1964),” Medieval Hollywood, accessed April 24, 2019, http://medievalhollywood.ace.fordham.edu/items/show/7.